We recognize that assessments are fraught with potential issues for the patient, the doctor, and the reader, all of whom place their trust in us. Here are the steps we take to ensure that the information shared is authentic. We publicly characterize each patient by their diagnosis, age, outcome, treatment type, and the number of doctors they have seen, amongst other attributes. This way readers can ascertain whether the reviewer's perspective is relevent to them, how hard of a case they were to treat, and how their outcome may influence their opinions. Without knowing whom you are hearing from there is simply no way to calibrate what you are reading. 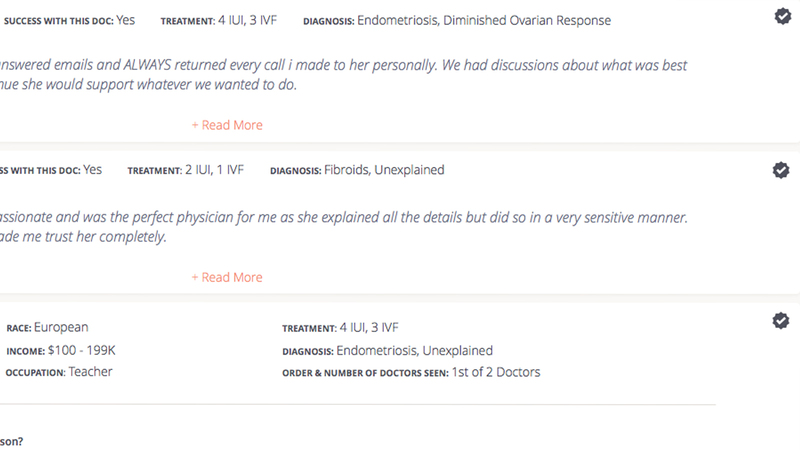 We consulted over 200 doctors, nurses, embryologists, therapists and patients to ensure the questions we ask are relevent, properly-posed, and thoughtfully ordered. We ask each patient to answer upwards of 80 questions which requires they carefully reflect upon their experience before grading the doctors, nurses, clinic and billing department. (As a result, the majority of our assessments are not at the extremes of 0 or 10 out of a 10 point scale). The patient characterizes each of these groups seperately to help minimize how one department or constituency might influence another's grade. Once a doctor changes clinics, the portions of the assessments about them will travel with them to the next clinic, while the portions of the assessments about the nurses, clinic and billing department remained locked at the previous clinic. Patient assessments are anonymous to the public and no personally identifiable information (name, email address) is displayed to the public. The majority of patients provide us with a document that proves they were a patient of the clinic they are assessing. Those reviews are marked with a "verified" checkmark for other readers to see.